Vivienne Tam has built a presence in fashions that are appealing to all ages, ethnicities, and income levels. She has earned the reputation for offering a stylish and high-quality product while at the same time inviting the consumer to experience the inspiration behind it. A longstanding dedication to innovation and exotic imagery, Vivienne Tam is truly one of the world’s most passionate and symbolic designers in fashion today. As a designer of clothing that suggests tolerance, global acumen, and a Fourth of July faith in individual expression, Tam, in the words of fashion critic and curator Richard Martin, possesses an idealistic globalism that transcends politics and offers a more enchanted, peaceful world. Born in Canton, China, Vivienne Tam moved to Hong Kong when she was three years old. Her bi-cultural upbringing in the then British colony was the first stage in the development of her signature East-meets-West style. After graduating from Hong Kong Polytechnic University, Vivienne Tam moved to New York where she thrived on the excitement and energy of the fashion world. New York became a home for her and a continuing source of stimulation for her designs. In 1994, Vivienne Tam launched her signature collection of Eastern inspired clothing with a modern edge on the New York runways. 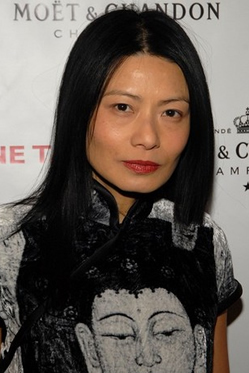 In 1995, she introduced the influential Mao collection that triumphantly crossed over from the fashion world into the art world. Then in 1997 Vivienne Tam launched the venerable Buddha collection. The public and celebrities around the world quickly embraced both collections. Some of the images became so popular that scores of designers even adopted the look into their designs. Pieces of the collections were ultimately incorporated into the permanent archives of the Andy Warhol Museum in Pittsburgh, The Museum of FIT and the Metropolitan Museum of Art in New York, and the Victoria and Albert Museum in London. In an era where the fashion industry is populated by numerous names and emerging new talents, Vivienne Tam has shown that she can consistently appeal to everyone from high-society to urban to teens, offering them fresh collections every season. She is poised to become the next multi-tasking, multi-successful designer and businesswoman. No user commented in " Vivienne Tam "